Summary: This photograph shows inmates, A. G. Brown, prisoner #9178 and Moses Chambers, prisoner #3250. 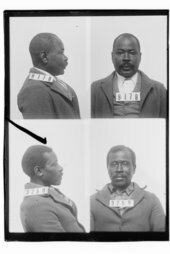 A.G. Brown was received at the Kansas State Penitentiary on December 22, 1899 from Oklahoma for forgery. Inmate Moses Chambers was received on May 14, 1884 from Leavenworth County, Kansas for murder and sentenced to death by hanging. Space Required/Quantity: Dry Plate Negative; Image/tiff; 5" by 7"
Kansas State Agencies. Department of Corrections.